Phenolic resin bonded felts are fibrous composite materials made from reclaimed natural fibres (mainly cotton), synthetic fibres (e.g. polyester fibres) and/or glass fibres, plus a powdered phenolic resin binder. Phenolic resins are the binding agent of choice for bonded felt products used in acoustic and thermal insulation applications across a range of industries such as automotive, household appliances and domestic construction. The felt substrate used in the manufacturing process normally has an aerodynamic web structure, or is formed via carding technology to create a felt mat with good distribution of the resin binder. The felt mat containing the phenolic binder is transferred to a hot air oven, where the binder softens and is semi cured, or may be fully cured in order to mechanically bond the fibers within the felt mat. Depending on the final application of the bonded felt it is possible to manufacture products that are either unshaped or shaped (pressed). The curing oven temperature for unshaped felts mats is typically in the range 160 – 200°C and felt material is semi cured/fully cured when it leaves the oven. For shaped (pressed) products, the oven temperature may be lower and/or the residence time may be shorter as the felt mat is only partially cured in the oven. The material becomes fully cured only after the final pressing operation. 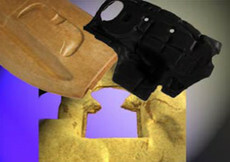 Pressing is normally carried out in a heated mould at 170 – 195°C. This process can also involve the application of a decorative surface to the shaped article. 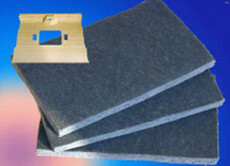 The final properties of the resin bonded textile felt, such as mechanical strength, damping behavior, thermal resistance and environmental impact, are determined by a number of factors including: the type of resin used, the composition of the felt and the processing parameters used during the manufacturing process. The powder resin used is typically a phenolic novolak with very low monomer content and containing 5-10 % cross linking agent (usually hexamine) in order to allow it to cure at elevate temperatures. A broad range of modification options are available for the phenolic resin to modify the technical properties of the finished textile felts and develop new products e.g. low odour & odour free systems, highly fire retardant materials, accelerated cure binders, low dust systems etc. Alternative binder systems have disadvantages in performance and/or price. Phenolic resin binders for felts offer the best compromise of performance and economy in use. Phenolic resins for felts give the best technical performance and economy. The broad possibility to modify Phenolic resins in order to reach low odour systems, high fire retardant materials, fast curing and low dust products makes it the most preferred binder.